Dear Sir, I received some days ago your letter of June 30, and the printed Circular to which it refers. I have always felt a more than ordinary interest in the destinies of Kentucky. Among her earliest settlers were some of my particular friends and Neighbors. And I was myself among the foremost advocates for submitting to the Will of the “District” the question and the time of its becoming a separate member of the American family. Its rapid growth & signal prosperity in this character have afforded me much pleasure; which is not a little enhanced by the enlightened patriotism which is now providing for the State a Plan of Education embracing every class of Citizens, and every grade & department of Knowledge. No error is more certain than the one proceeding from a hasty & superficial view of the subject: that the people at large have no interest in the establishment of Academies, Colleges, and Universities, where a few only, and those not of the poorer classes can obtain for their sons the advantages of superior education. It is thought to be unjust that all should be taxed for the benefit of a part, and that too the part least needing it. If provision were not made at the same time for every part, the objection would be a natural one. But, besides the consideration when the higher Seminaries belong to a plan of general education, that it is better for the poorer classes to have the aid of the richer by a general tax on property, than that every parent should provide at his own expence for the education of his children, it is certain that every Class is interested in establishments which give to the human mind its highest improvements, and to every Country its truest and most durable celebrity. Learned Institutions ought to be favorite objects with every free people. They throw that light over the public mind which is the best security against crafty & dangerous encroachments on the public liberty. They are the nurseries of skilful Teachers for the schools distributed throughout the Community. They are themselves schools for the particular talents required for some of the Public Trusts, on the able execution of which the welfare of the people depends. They multiply the educated individuals from among whom the people may elect a due portion of their public Agents of every description; more especially of those who are to frame the laws; by the perspicuity, the consistency, and the stability, as well as by the just & equal spirit of which the great social purposes are to be answered. Without such Institutions, the more costly of which can scarcely be provided by individual means, none but the few whose wealth enables them to support their sons abroad can give them the fullest education; and in proportion as this is done, the influence is monopolized which superior information everywhere possesses. At cheaper & nearer seats of Learning parents with slender incomes may place their sons in a course of education putting them on a level with the sons of the Richest. Whilst those who are without property, or with but little, must be peculiarly interested in a System which unites with the more Learned Institutions, a provision for diffusing through the entire Society the education needed for the common purposes of life. A system comprizing the Learned Institutions may be still further recommended to the more indigent class of Citizens by such an arrangement as was reported to the General Assembly of Virginia, in the year 1779, by a Committee appointed to revise laws in order to adapt them to the genius of Republican Government. It made part of a “Bill for the more general diffusion of knowledge” that wherever a youth was ascertained to possess talents meriting an education which his parents could not afford, he should be carried forward at the public expence, from seminary to seminary, to the completion of his studies at the highest. But why should it be necessary in this case, to distinguish the Society into classes according to their property? When it is considered that the establishment and endowment of Academies, Colleges, and Universities are a provision, not merely for the existing generation, but for succeeding ones also; that in Governments like ours a constant rotation of property results from the free scope to industry, and from the laws of inheritance, and when it is considered moreover, how much of the exertions and privations of all are meant not for themselves, but for their posterity, there can be little ground for objections from any class, to plans of which every class must have its turn of benefits. The rich man, when contributing to a permanent plan for the education of the poor, ought to reflect that he is providing for that of his own descendants; and the poor man who concurs in a provision for those who are not poor that at no distant day it may be enjoyed by descendants from himself. It does not require a long life to witness these vicissitudes of fortune. It is among the happy peculiarities of our Union, that the States composing it derive from their relation to each other and to the whole, a salutary emulation, without the enmity involved in competitions among States alien to each other. This emulation, we may perceive, is not without its influence in several important respects; and in none ought it to be more felt than in the merit of diffusing the light and the advantages of Public Instruction. In the example therefore which Kentucky is presenting, she not only consults her own welfare, but is giving an impulse to any of her sisters who may be behind her in the noble career. Throughout the Civilized World, nations are courting the praise of fostering Science and the useful Arts, and are opening their eyes to the principles and the blessings of Representative Government. 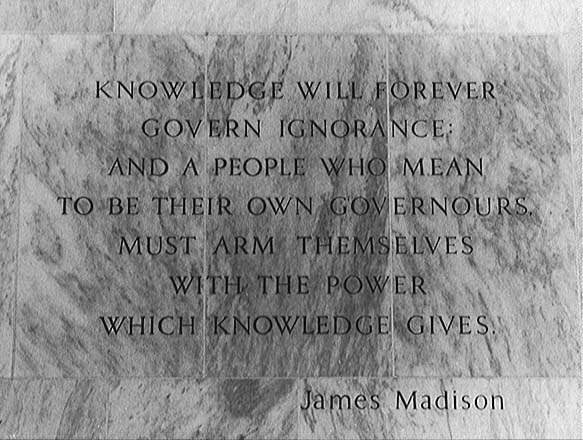 The American people owe it to themselves, and to the cause of free Government, to prove by their establishments for the advancement and diffusion of Knowledge, that their political Institutions, which are attracting observation from every quarter, and are respected as Models, by the newborn States in our own Hemisphere, are as favorable to the intellectual and moral improvement of Man as they are conformable to his individual & social Rights. What spectacle can be more edifying or more seasonable, than that of Liberty & Learning, each leaning on the other for their mutual & surest support? The Committee, of which your name is the first, have taken a very judicious course in endeavouring to avail Kentucky of the experience of elder States, in modifying her Schools. I enclose extracts from the laws of Virginia on that subject; though I presume they will give little aid; the less as they have as yet been imperfectly carried into execution. The States where such systems have been long in operation will furnish much better answers to many of the enquiries stated in your Circular. But after all, such is the diversity of local circumstances, more particularly as the population varies in density & sparseness, that the details suited to some may be little so to others. As the population however, is becoming less & less sparse, and it will be well in laying the foundation of a Good System, to have a view to this progressive change, much attention seems due to examples in the Eastern States, where the people are most compact, & where there has been the longest experience in plans of popular education. I know not that I can offer on the occasion any suggestions not likely to occur to the Committee. Were I to hazard one, it would be in favour of adding to Reading, Writing, & Arithmetic, to which the instruction of the poor, is commonly limited, some knowledge of Geography; such as can easily be conveyed by a Globe & Maps, and a concise Geographical Grammar. And how easily & quickly might a general idea even, be conveyed of the Solar System, by the aid of a Planatarium of the Cheapest construction. No information seems better calculated to expand the mind and gratify curiosity than what would thus be imparted. This is especially the case, with what relates to the Globe we inhabit, the Nations among which it is divided, and the characters and customs which distinguish them. An acquaintance with foreign Countries in this mode, has a kindred effect with that of seeing them as travellers, which never fails, in uncorrupted minds, to weaken local prejudices, and enlarge the sphere of benevolent feelings. A knowledge of the Globe & its various inhabitants, however slight, might moreover, create a taste for Books of Travels and Voyages; out of which might grow a general taste for History, an inexhaustible fund of entertainment & instruction. Any reading not of a vicious species must be a good substitute for the amusements too apt to fill up the leisure of the labouring classes. I feel myself much obliged Sir by your expressions of personal kindness, and pray you to accept a return of my good wishes, with assurances of my great esteem & respect. Careful readers will note Madison assumed public schools; he had been one of those who contributed to the Northwest Ordinances, which set aside pieces of every township, which land was to be used to create public schooling on the frontiers of America. If you think Madison’s description of what was to be taught and how sounds an awful lot like Advanced Placement (AP) courses, or the International Baccalaureate curriculum (IB), you’d be in good company. As opposed to those yahoos who oppose AP or question IB. * This line was a favorite quote of Education Secretary Bill Bennett when I published his works in the area. I cannot say whether he still favors Madison’s view, but once upon a time Bennett was rational on these issues. Teacher ratings can’t tell good teachers from bad ones — back to the drawing board?